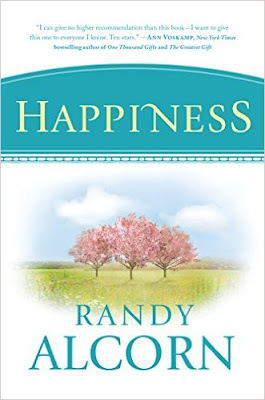 Two years ago I started reading Happiness by Randy Alcorn. I have greatly enjoyed reading this book, and I have learned so much! I was given a complimentary copy from Tyndale House Publishers in exchange for a review. I never thought that it would take me two years to finish reading this book and write my review. My thanks to Tyndale for their patience with me! Happiness is a very big book (481 pages), and it has been a slow read for me. I could have read it quickly simply to get through it. But it is so good, and there is so much Scripture referenced in it, that I wanted to take my time. I went through this book slowly and carefully with my Bible next to me and my pen in hand. I underlined and starred numerous sections. I looked verses up in my Bible and took notes. I studied what Scripture has to say about happiness while I read this book. I want to share with you just a little of what I have learned by reading Happiness. It seems to have become a common misconception that as Christians we are to be joyful, but not happy. Sometimes it is taught that joy is godly, and happiness is worldly. We should be joyful, but we should not seek to be happy. Joy is enduring; happiness is fleeting. God cares about our holiness, but not our happiness. The Bible does talk a lot about joy and rejoicing, but it also talks about happiness and gladness, and these words are used parallel to one another in Scripture. It has only been in recent years that Christians have begun to think that we shouldn’t be happy; we should be joyful instead. 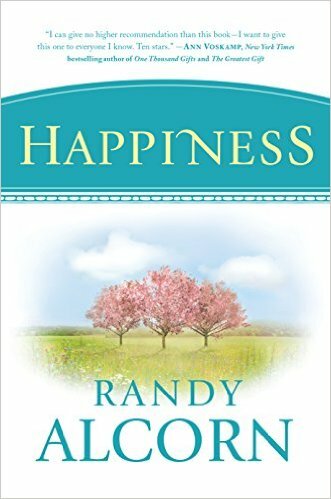 It was interesting to read about this change in thought and teaching, which Randy covers in chapter five, What’s the Difference between Joy and Happiness? It is not just okay to be happy; it is good to be happy. We are even commanded to be happy! 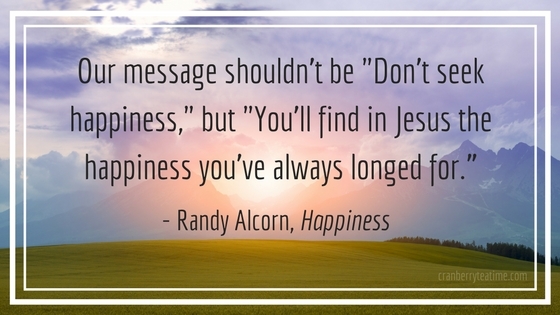 Randy Alcorn says, “Paul’s words in Philippians 4:4 are often translated ‘Rejoice in the Lord always, and again I say rejoice.’ They could also be translated, ‘Be happy in the Lord always, and again I say be happy.’ Commenting on this verse, Spurgeon said, ‘It is intended that we should be happy. That is the meaning…that we should be cheerful’” (page 18). 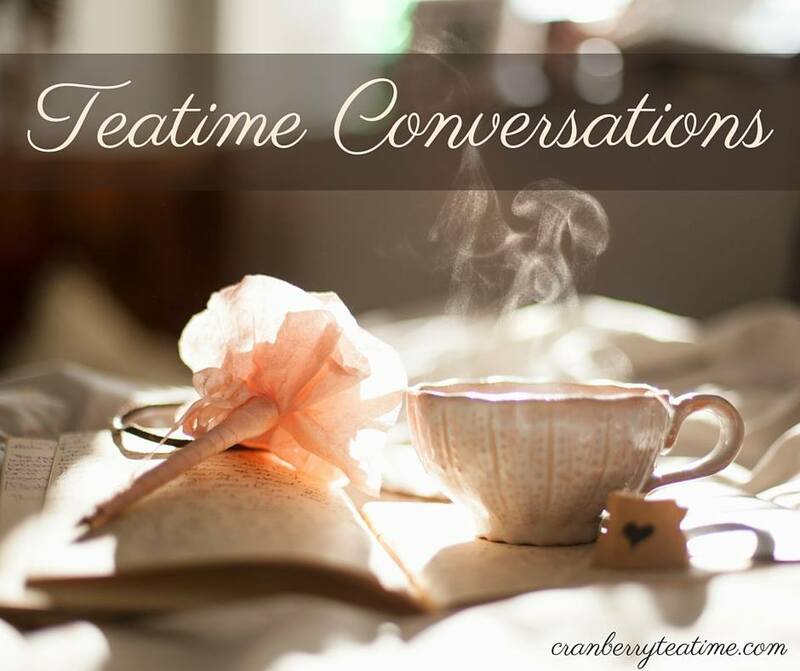 I found each of these sections to be helpful, insightful, and fascinating! While reading Happiness, I was struck by how often we are commanded in Scripture to be happy, and I've been reminded of how much we have to be happy about. Of all people, Christians should be the happiest on earth! 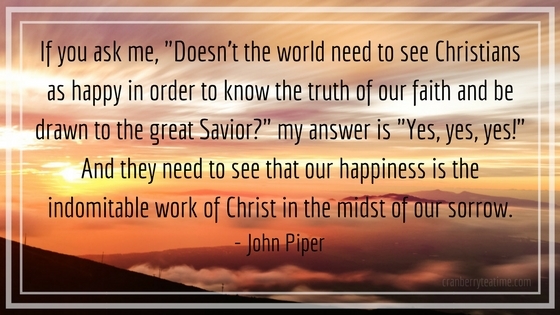 The gospel is good news of great joy - good news of great happiness! What a wonderful thing to remember during the Christmas season and throughout the year. If forgiveness of sins and the promise of eternity in Heaven with Jesus isn't a reason for happiness, then I don't know what is. It is the hope of the Gospel that keeps me going on the hard days. It is the promise of eternal life that brings me happiness when the sorrows of life in a fallen world overwhelm. Pursuing Christ and enjoying His good gifts brings happiness in the midst of suffering. Happiness was an excellent book to read, and it is one that I will keep on my bookshelf as a reference for years to come. I highly recommend Happiness! This is a message that is needed by Christians today. It is a message that is needed by the world. 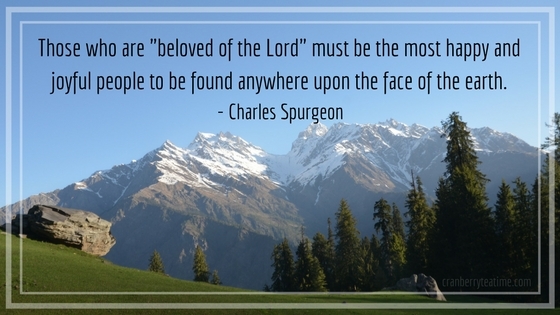 There is true and lasting happiness to be found, and that happiness is found in knowing Jesus Christ as your Savior and living for Him alone. Happiness is a good and thorough book. If you aren’t able to read such a long book, you might enjoy 60 Days of Happiness. If you want to read Happiness, you can find it at the EPM store and on Amazon.